If you are interested in the Sikes Adobe Historic Farmstead, and especially if you are interested in participating in a “Friends of the Sikes Adobe” support and fundraising group, please contact leana@sdrp.org or (858) 674-2275 x14. Zenas Sikes’ obituary says that he and his wife Eliza moved to Santa Clara from Ohio in a covered wagon after they married in 1853. However, research indicates that Eliza, who was born in Ohio, moved to California with her stepmother Clarissa Burrell and arrived in January 1853. They came west around Cape Horn on the ship “Westward Ho” to join her stepfather Lyman Burrell, who had come west overland in 1849 to become a gold miner. The Sykes (Sikes) family has been documented back to Massachusetts in the 1600s, but they had moved to Michigan by 1837. Zenas appears to have left Michigan in March 1850 with three brothers, arriving in California five months later. Census records of 1852 list Zenas and his brothers Charles, Loring, and Samuel as living in Santa Clara County, California. In July 1853, Zenas and Eliza married in California. 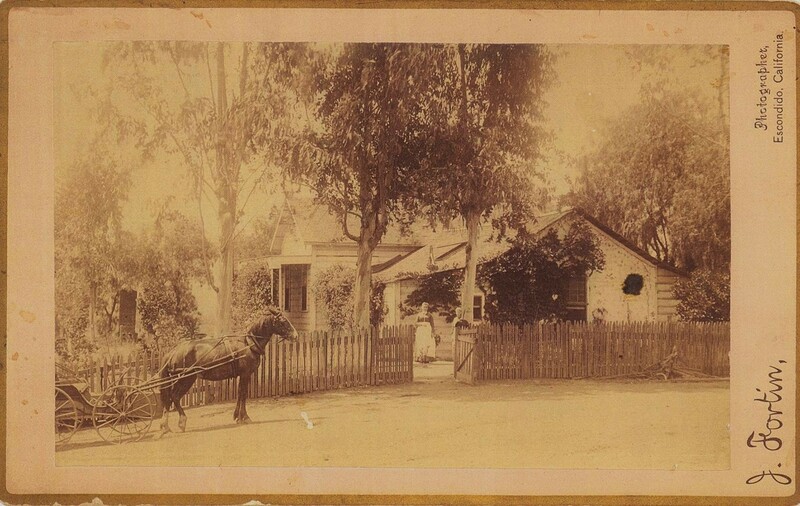 In 1868, they purchased a 2,400 acre portion of the former Rancho San Bernardo for $2,500. With their six children, they moved on their property by 1872, and built a one-room adobe structure to live in. Additional rooms in the Greek revival style, popular during the Victorian era, were soon added to the one room structure. These additions were of wood, not adobe. Based on letters written by Eliza, we know that the farmhouse reached its final outer dimensions by 1881. Zenas Sikes died in surgery in April 1881, as a result of being kicked by a horse on his leg twice. Eliza used the insurance payments in part to remodel the house extensively and to upgrade the furnishings. She also continued the wheat farming business. The family’s fortunes slowly declined in the decade after Zenas’ death. Wheat became less profitable as competition grew and the land became less fertile. The family began a dairy operation. Debts piled up and in 1897, the property was sold to August Barnett for $10 to pay off the mortgages he held on the property. In 1917, the house was purchased along with the buildings in the Bernardo community as part of the Lake Hodges Dam Project, initatied by Col. Ed Fletcher. The Sikes and their neighbors became founders of a community of pioneer farmers that settled the former Rancho San Bernardo in the 1870s. They developed the region into productive agricultural lands that supported a rural society. Settlement of the agricultural hinterland was critical to the infant city of San Diego. Farmers were desperately needed to feed the expanding urban population and provide markets for local business. Farmers in the region prospered largely as a result of grain cultivation. During initial settlement, pioneer farmers needed a product that could be quickly and cheaply produced. Grains could be planted quickly with little initial investment and offered a quick cash return at the end of the season. Wheat was first planted on a large scale in the Central Valley during the late 1860s. It became the largest and most profitable crop in California between 1860 and 1893. California winter wheat quickly gained the reputation as premium wheat by millers in England, Ireland, and parts of Europe by the 1870s. Known abroad as “California white velvet”, the wheat was harvested in the summer and could be shipped thousands of miles with little degradation. The quality was unusually hard and dry, making it suitable for long maritime transport around Cape Horn. The Town of Bernardo was a small townsite, located about 2,000 feet east of the Sikes Farmhouse on the main road between San Diego and the northern regions of present-day San Diego County. The town consisted of about a half-dozen buildings that included a general store, blacksmith shop, and Grange Hall. The town served a community of about 400 people in outlying areas. The official founding of the community of Bernardo occurred on December 3, 1872 when a post office was established at the Sikes Farmstead with Zenas Sikes as postmaster. Zenas was the first master of the Bernardo Grange, a local chapter of a national fraternal association of farmers. The Grange was also important in the social life of the community, organizing picnics and balls. The general store at Bernardo was a landmark in the region for 40 years, serving as the main commercial outlet for Valley Center, Rincon del Diablo (present-day Escondido), San Pasqual, Bernardo, and Poway areas. The establishment of Escondido in the late 1880s caused the gradual decline of the general store and the town. Bernardo continued to exist as a community until the construction of the Lake Hodges Dam in 1918. By that time, the City of Escondido had become the dominant market town in northern San Diego County. The site of the store and the post office was purchased as part of the Lake Hodges reservoir. The San Diego County Committee of the National Society of Colonial Dames of America provided initial assistance to the Farmhouse’s interior furnishings. The Colonial Dames researched additional history about the Sikes family and about interior furnishings known to have been owned by the family, and researched additional furnishings specific to the period, locale, and income level. We are fortunate to have extensive probate records for the Sikes family after Zenas’ death. The records give information about their household furnishings, farm equipment, grocery supplies, and various aspects of life on the farm. Book: Ancestors and Descendants of Zenas Sikes, Jr.